According to the theory of left-brain or right-brain dominance, each side of the brain controls different types of thinking. Additionally, people are said to prefer one type of thinking over the other. For example, a person who is “left-brained” is often said to be more logical, analytical, and objective. A person who is “right-brained” is said to be more intuitive, thoughtful, and subjective. In psychology, the theory is based on the lateralization of brain function. The brain contains two hemispheres that each performs a number of roles. The two sides of the brain communicate with one another via corpus callosum. The left hemisphere controls the muscles on the right side of the body while the right hemisphere controls those on the left. This is why damage to the left side of the brain, for example, might have an effect on the right side of the body. Generally speaking, the left side of your brain controls the right side of your body, and the right side of your brain controls the left side of your body, according to the website The Brain from Top to Bottom, which was written and developed by Bruno Dubuc, a neuroscientist at McGill University in Montreal. Things get more complicated for vision: Nerves from the left sides of both eyes connect to the left side of the brain, and nerves from the right sides of both eyes connect to the right side of the brain. In the19th century, a pair of neuroscientists — Dr. Pierre Paul Broca and Dr. Karl Wernicke — found that people who struggled with language processing tended to have damage to specific areas on the left sides of their brains. The researchers concluded that those two areas were important to language processing, announcing to the world that language lives in the left brain. That idea is probably at the root of this notion that the left brain is more creative and the right brain is more analytical. Are you more left-brained or right-brained? Look at the image below, and choose the face that appears to be the happiest, in your opinion. Then, read below to see what it says about your hemisphere function. If you chose “A” you are Left-Brained. 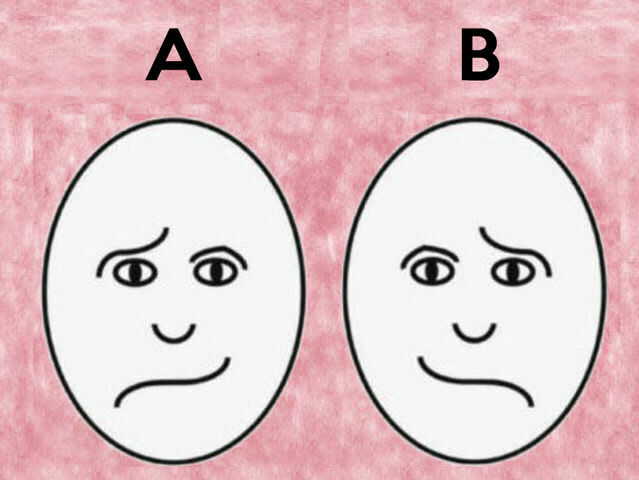 If you chose “B” you are Right-Brained. What do you think about this theory? Let us know in the comments!